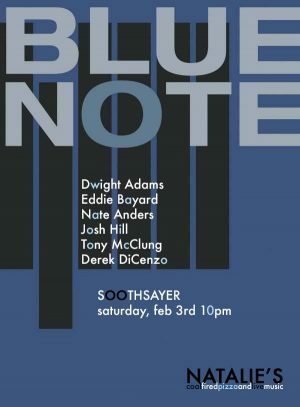 Soothsayer (artwork by Lesley Raye), presenting “A night of classic Blue Note jazz with an ear forward,” will perform at Natalie’s on Saturday, February 3rd at 10pm. Tickets are available here. Building from successful tribute projects like the Sanctuary Miles Davis band and the Such Sweet Thunder project in honor of Duke Ellington, drummer Tony McClung has assembled another high-level look into classic jazz, this time focused on the influential albums released by Blue Note Records in the 1950s and 1960s. McClung will be joined on the bandstand by an astounding cast: Dwight Adams (trumpet), Eddie Bayard (saxophone), Josh Hill (guitar), Nate Anders (vibes), and Derek DiCenzo (bass). McClung was kind enough to provide thoughts on this special music and special night – keep reading to learn more. Tony McClung: “There’s something very special about Blue Note recordings in the 50s and 60s. Even though most of the rotating cast of musicians recorded for other labels too and Rudy Van Gelder (the brilliant recording engineer behind the sound) worked for other labels also, Blue Note sessions were different. The musicians were paid to rehearse before the sessions which yielded a higher quality of playing. The owners also took care of the musicians at the sessions. Alfred Lion produced the sessions with objectivity but also with the respect these musicians deserved. Francis Wolff took the beautiful photographs of the musicians that graced most covers. Musicians felt like they were valued as they should be at Blue Note.